The Batcave - Mon-El finally suits up! At last, Mon-El finally gets his costume! The CW have showen Mon-El in a costume that bears little resemblance to his comic book counterpart, which he wore in the midseason premiere “The Legion of Super-Heroes.” The earlier photo found him in a blue leather jacket rather than a true superhero getup. 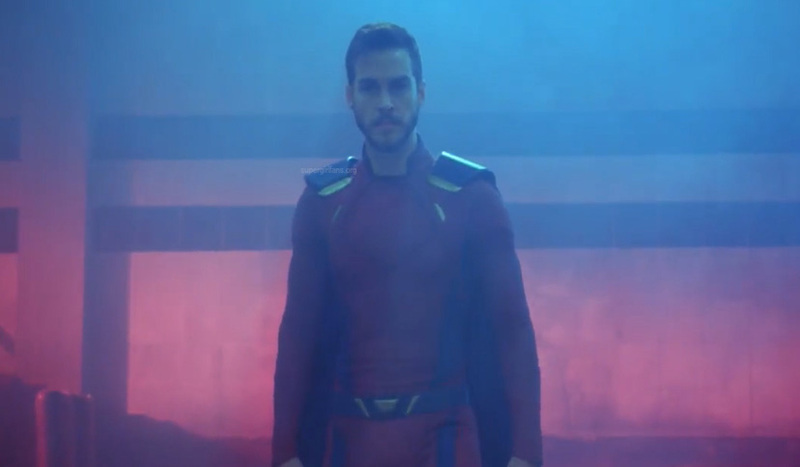 However, this trailer depicts Mon-El in a costume more relevant to his traditional red and blue military inspired costume from the comics, complete with those terrible epaulets that the stupid costume designer for the show put their version of Superman in and a flowing cape. The centre of the costume seems to have a triangular imprint that mimics the House of El’s symbol as it appears on Supergirl and Superman’s costumes. The rest of the promo — which features stars from The Flash, Arrow, DC’s Legends of Tomorrow, Black Lightning, Riverdale and more — doesn’t seem to contain any other surprises. Have to say I’m well pleased that the CW have finally decided to show Mon-El in a full costume, even if it’s not exactly 100% accurate, but at least there is some resemblance to his comics version. Except for those ludicrous epaulets! I’m just hoping that when he finally shows up wearing the uniform, the CW don’t just show him for 5 minutes then pack him off back to the future with the rest of the Legion. I really want to see him stay around wearing his uniform for a few episodes!